Send your loved one off with an elegant casket spray that truly encompasses the warmth they brought to your family with the Hushed Goodbye casket spray. 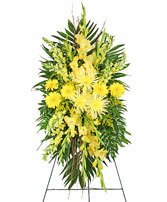 White lilies, roses, and spider mums contrasting against a lush sea of aspidistra will bring comfort to the hearts of the family and friends in their time of grief and sorrow. AS SHOWN: 1/2 CASKET SPRAY. 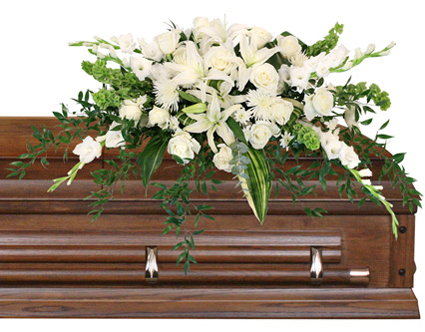 60" CASKET PC AVAILABLE PRICED AT 175.00. 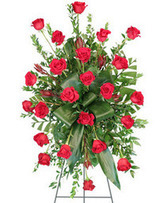 MUST CALL US DIRECT @ 562/599-9742 TO PLACE THIS LARGER CASKET PC ORDER. WE CON CIDER OUR SELVES A WHOLESALE FUNERAL FLOWER SHOP. " WHY PAY MORE "